Macrame is having a ‘moment’ right now. Load up Pinterest and you’ll see it popping up everywhere – from bracelet tutorials on DIY fashion blogs to hanging basket holders in interior design magazines. For the unacquainted, macrame is the technical name for the process of creating a new textile, typically by knotting lengths of cotton, leather, cord, yarn or rope. The macrame trend is nothing new though: it was big in the 1970s, and according to Wikipedia, its most popular era was during the late 1800s, during the rule of Queen Victoria. Apparently, the skill dates back to the 13th century and the name comes from an old arabic word meaning “Fringe”. 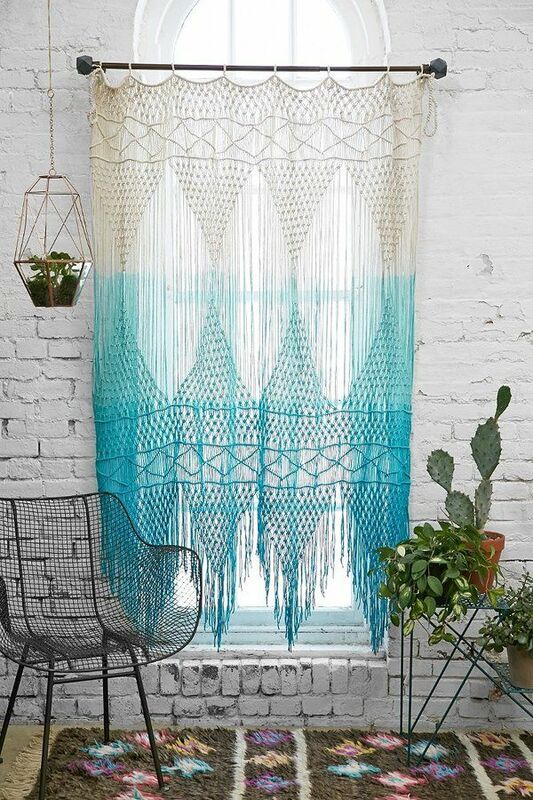 Macrame wall hangings are the perfect finishing touch for a bohemian or eclectic style room. If they still conjure up images from the 1970s for you, banish them. Today it’s all about bright neon accents woven into the design, ombre dipping effects and fun embellishments. 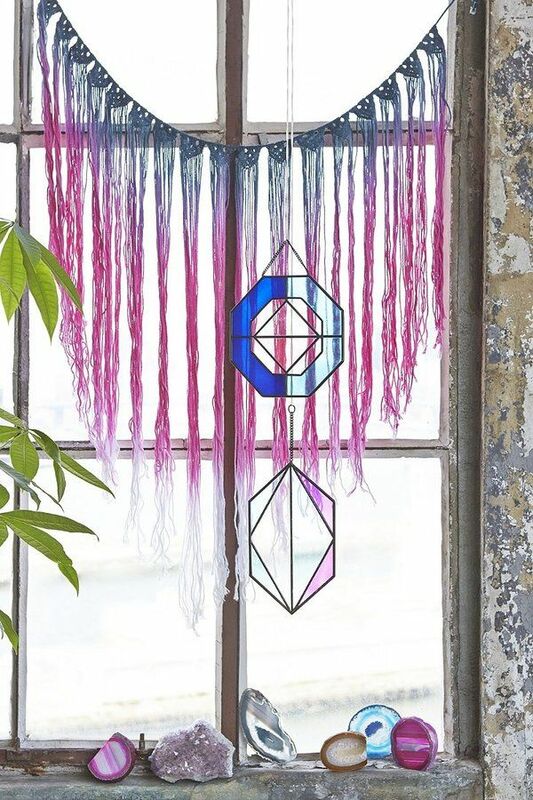 You really cannot go wrong with Etsy – it’s perfect if you’re looking for a unique, handmade macrame wall hanging, as most of them are made to commission. SlowDownProductions is THE shop to check out, the owner is seriously talented. Her wall hangings (and plant hangers) look so professionally made and they come in a rainbow of fun and funky colours! My favourite is the purple one (centre), which do you like? When I say macrame to you, I’m guessing Nordstrom is not the first shop that comes to mind. However, the department store now stocks macrame wall hangings and plant hangers by American brand Faire Un Noeud. Prices are fairly reasonable too, starting from £33 for a driftwood hanging. 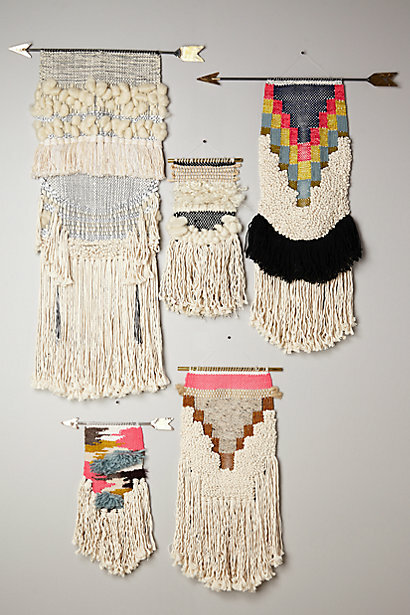 OK, I’m kind of cheating here because these are tapestries rather than macrame per se, but Anthropologie’s pieces do share some similar qualities as the other hangings on this page. How stunning are these? They’re one-of-a-kind handmade pieces crafted from jute, wool, cotton and steal. They’re made in the USA too. 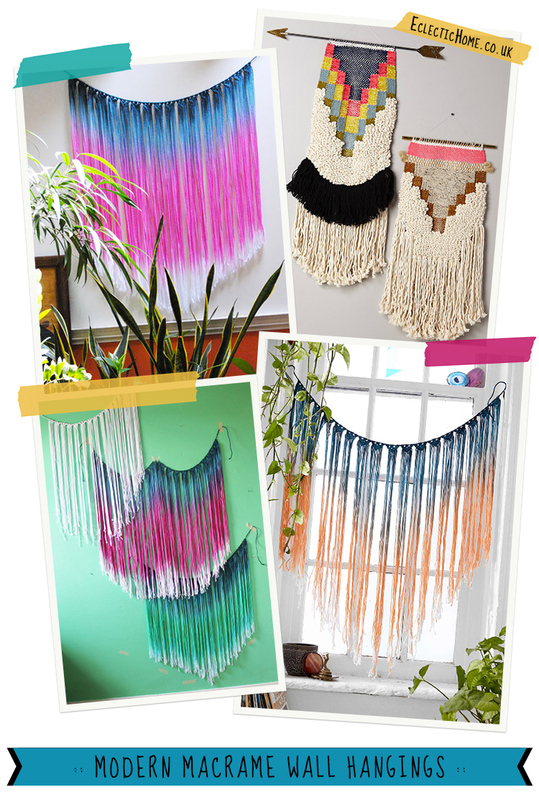 Which of the macrame wall hangings do you like? Which is your favourite? My personal favourite is the stunning purple piece from Etsy, right at the top of this page. Do feel free to share your favourites in the comment section, or link us to your shop if you’re selling macrame wall hangers too.